These long-lived tank engines were the oldest tank engines in the LNER's service, and managed to survive into BR ownership. Five engines were built by Ruston & Proctor in 1868 for the GER. Originally ordered by Johnson as simple tank engines, they were rebuilt by Bromley in 1881. These rebuilds included the addition of half cabs. James Holden rebuilt No. 205 with a 3-ton crane in 1891 for use at Stratford Works. Nos. 204&206 were also converted in 1893, but the other two engines (Nos. 207/8) were scrapped between 1889 and 1892. 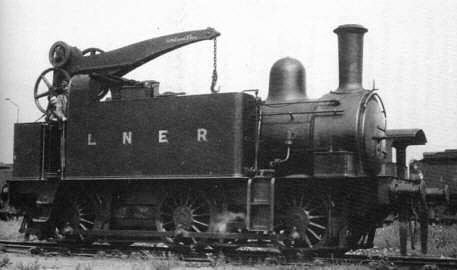 Holden's crane conversion also incorporated the addition of steam brakes. The three survivors were redesignated B,C, and D in 1894. These letters survived until Thompson's renumbering when they were allocated the numbers 8667, 8668, and 8669 respectively. These crane engines were originally allocated the LNER class designation of Z4, but were reclassified as J92 in 1927. All three locomotives spent most of their working lives at Stratford Works. They were withdrawn between 1950 and 1952. The following describe the J92s at Grouping in 1923. Heating Surface: Total: 990.21 sq.ft. None of the Z4 / J92 crane tanks survived into preservation. I am not aware of any models of the Z4 / J92 crane tanks.